Working mom. Local values. Building community. Ashley can provide the effective leadership when we need it the most. Ashley Lehualani Kierkiewicz was born and raised in Hilo. She's a working mom and engaged in her community. Her father, James, hailed from Massachusetts. Her mother, Marieta Carino, moved to Pāhoa with her four sisters and their widowed mother from Ilocos Norte, Philippines. Ashley's maternal great-grandfather was a Sakada who worked in the Kea‘au sugar plantation. From an early age, Ashley worked at her father's gas station and auto recycling facility after school and on the weekends. While she never developed a passion for cars, she learned what it meant to work hard, problem solve and the value of a dollar. Always eager to learn and capture new experiences, she had her own weekly radio show – Teen Talk with Ashley on 107 Jams – for two years while in high school. During her time as on-air the "Hostess with the Mostess," Ashley discussed teen life and trends, interviewed community leaders and elected officials, hosted a Mayoral Forum, and coordinated monthly drug- and alcohol-free dances (Ash Bashes) for teens. After graduating from St. Joseph High School in 2004, Ashley moved to San Diego to work and study photography. She moved back to the islands and pursued a bachelor's in political science at the University of Hawai‘i at Hilo. Interested in diplomatic relations, Ashley was part of a UH Hilo team that competed in a 2009 Model United Nations event in New York and won Outstanding Delegation (equivalent to 2nd place) among more than 3,000 students from 200 schools around the world. She is a member of Pi Sigma Alpha and was chosen as the Outstanding Graduating Political Science Senior in 2011. While in college, she interned with the County Department of Environmental Management and with the office of US Senator Daniel Akaka in Washington D.C.
For the last seven years, Ashley has worked in communication and outreach for Hastings & Pleadwell: A Communication Company, assisting a range of highly visible clients statewide in government, private business and the nonprofit sector including the Executive Office on Early Learning, Parker Ranch, Suisan, and HOPE Services. In 2014, Pacific Business News recognized her as a Woman to Watch in business. A firm believer in giving back to community, Ashley is president of the Zonta International Club of Hilo, whose mission is to empower women through service and advocacy. She serves on the board for YWCA of Hawai‘i Island, and is a former board member of the Hawai‘i Island Economic Development Board. 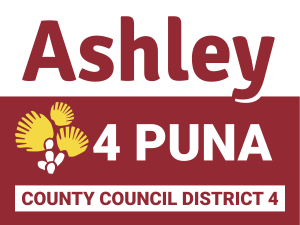 Ashley is a member of the Japanese Chamber of Commerce & Industry of Hawai‘i and Mainstreet Pāhoa. She served as vice-chair of the 2014 County Cost of Government Commission. Ashley's professional and volunteer work provided opportunities to cultivate meaningful relationships, and broad perspective, which has helped her better understand the strengths, challenges and needs of our community. She is invested in our island and passionate about helping shape our collective future. In response to the May 2018 lava eruptions, Ashley started Pu‘uhonua o Puna Info & Supply Hub with Ikaika Marzo, Gilbert Aguinaldo and others. She's working with Project Vision Hawaii to raise funds for mobile shower trailers to support ongoing disaster relief on Hawai‘i Island; to date, she's helped raise $75,000. A firm believer in empowering community, she would bring this collaborative, grassroots style of leadership to County government. 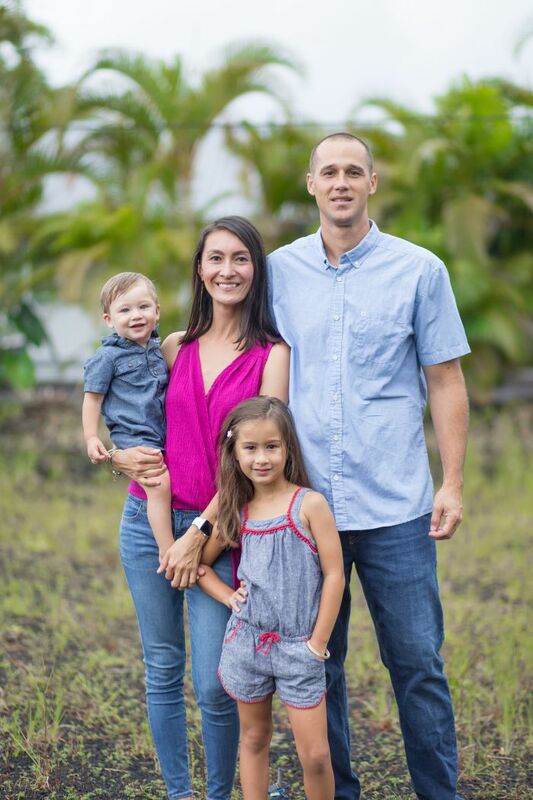 Ashley resides in Hawaiian Paradise Park with her fiancé, Kaui Nakanelua, a fire fighter with Hawai‘i County Fire Department. Together, they are raising two beautiful and spirited children – Arya (6) and Toby (1).